US blogger and freelance writer Tina Dupuy has seen some success, after posting a video complaining that the Tampa Tribune in Florida had failed to pay her $75. She claimed she submitted a piece to the newspaper, which was then published without replying to her first to negotiate a payment. She said she sent them an invoice and didn’t hear back. But following the video, the newspaper has now put her cheque in the post, she said in a new video this week. I am holding onto your check in the hopes we’d get you to do a YouTube video about not getting paid by us. We could use the plug. This entry was posted in Freelance, Online Journalism and tagged blogger and freelance writer, editor, editorial writer, Florida, freelancing, Jim Beamguard, Journalism. co.uk, la news daily, Mariel Garza, tampa tribune, the Tampa Tribune, tina dupuy, United States, USD, YouTube on September 10, 2009 by Judith Townend. 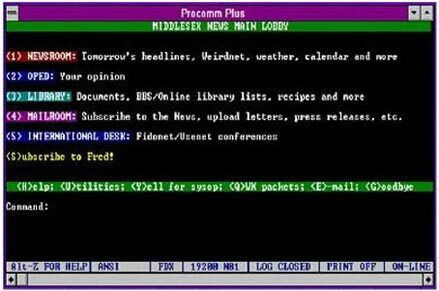 Today is the 15th birthday of the World Wide Web, marked by the CERN announcement on April 30 1993 that the web would be free to all. It’s a cue to sit back and marvel at how much has changed in a relatively small amount of time and post screen shots that may induce the same feeling as mum fetching the baby photos. After the WWW age was born, online news and journalism was swift to follow: The Tech – an online version of the Massachusetts Institute of Technology newspaper, went live in May 1993; closely followed by the first journalism site from the University of Florida that October. 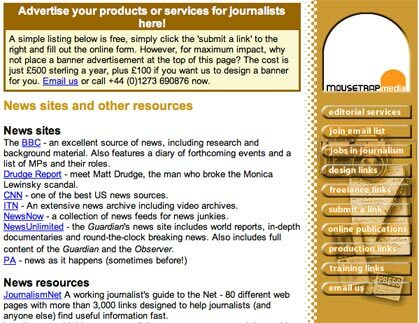 By 1994 there were already more than 20 online newspaper and journalism services. The Sunday Times and the Daily Telegraph were the first British papers to enter the online world in 1994 with the Beeb taking slightly longer to catch up, launching its news website in 1997. With web technology advancing daily, the slick news sites of today will surely be drawing fond smiles in another 15 years. This entry was posted in Newspapers, Online Journalism and tagged BBC, birthday Web, Florida, Journalism.co.uk, Massachusetts, Massachusetts Institute of Technology, online news, online newspaper, online version, online world, Sunday Times, the Beeb, the Daily Telegraph, the Sunday Times, University of Florida, web technology, web technology advancing on April 30, 2008 by ruth morgan.